alaTest has collected and analyzed 4 reviews of ASUS WiCast EW2000. The average rating for this product is 2.9/5, compared to an average rating of 4.2/5 for other Desktops for all reviews. Reviewers really like the usability. Many are negative about the size. We analyzed user and expert ratings, product age and more factors. Compared to other Desktops the ASUS WiCast EW2000 is awarded an overall alaScore™ of 82/100 = Very good quality. 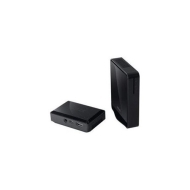 Easy wireless HDMI streaming; works on any laptop (or other HDMI-enabled source); streams Blu-ray movies. Clunky; requires power cables; image quality is average; Blu-ray streaming requires you to turn off the laptop display. As an alternative to Intel's built-in Wireless Display, the Asus WiCast is both easy to use and works on nearly any laptop--but it's also cumbersome and includes some DRM limitations.